Thank you for visiting. If you were here in person I’d offer you a cupcake or cook you a meal. Adventures In The Kitchen cooking school started as a blog in 2005. It’s hard to believe this space, my baby, is 13 years old. A desire to feed my creative soul led me to create this space. 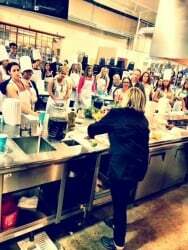 It was a place to share the recipes I created in my kitchen. I believe much of life takes place around the table. It is not just about food, it is a place we share our dreams, our days, our disappointments. Relationships are strengthened, trust is built in that time we share both in the kitchen and around the table. As a person who gathers people in small groups for a living, I believe something magical happens when you gather around the table with those you love. Maybe you left the table, your kids are grown up and off on their own. You are empty nesters and it feels a bit lonely around the table. Maybe like me, you are single and hate to eat alone. Invite someone to join you. I share recipes and write on family meals, entertaining and giving back to the community. You will find recipes on baking, everyday meals and special occasions. I share ideas for kids parties and home entertaining. You will even find a few freebies. My goal is to create mouth-watering recipes that will inspire you to cook. My Spring Raspberry Salad was published in the It’s Summer Cookbook by Betty Crocker in April 2010.